Finally, a festive, positive night at Fenway Park. The 1975 team’s 40th anniversary was recognized and 26 players from that team were on hand, including three Hall of Famers — Carl Yastrzemski, Jim Rice, and Carlton Fisk. A reminder of the good times. A nice Dr. Charles Steinberg production at a time when Red Sox Nation needed a little boost. It was on a night when the Red Sox were trying to stop free-falling, having lost four straight in a ballpark that’s not so homey. And they did it with a 2-0 win over the Rays behind two solo homers from the hope, Mookie Betts, seven innings of shutout ball from Rick Porcello, and a throwback save from Koji Uehara. The Sox were in last place in the AL East to begin the game, the same place they found themselves after 162 games of the 2014 season. Same place they found themselves after 162 games of the 2012 season. In the not-too-distant past was the September collapse (7-20) of 2011. And oh yes, one championship in 2013. It was one game. But a big game. And it took so long to develop in Boston’s favor as Rays starter Drew Smyly was no-hitting the Red Sox in a 0-0 game until Betts clobbered an offspeed pitch into the Monster seats, giving Boston a 1-0 lead in the sixth. Including the September collapse of 2011, the Red Sox are now 257-283 since then. 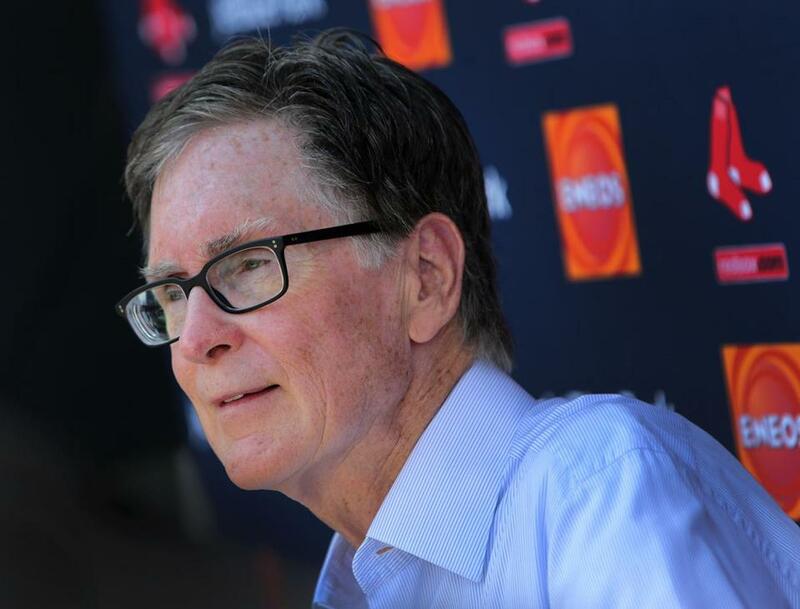 Searching for solutions, it was a good day for Red Sox principal owner John Henry, who also owns the Globe. He met with manager John Farrell, general manager Ben Cherington, and the front office staff Tuesday afternoon to discuss the state of the team. He may have been disappointed with the 12-14 start, but he expressed optimism on what was ahead. And he predicted the upturn would start with Tuesday’s game. And so Porcello, the $82.5 million man, played stopper. Uehara seems to have his act together again. His arm strength is just about there. The Sox offense didn’t exactly sting the ball, with only five hits. On this night, everything went according to plan. The Red Sox got themselves out of last place. During this 22-game stretch against AL East teams, they are now 7-11. They are 7-8 at Fenway. “Overall, we feel this is the right team,” Henry said. He said he had no regrets about the offseason moves. The biggest was not signing Jon Lester. “I think we made a lot of moves during winter to really shore up our pitching staff and our hitting, but we haven’t seen the results. This is a great group of guys. We’ve gone through a bad period, haven’t hit with runners in scoring position, we’ve given up runs early. It’s something we can’t do,” Henry told Miller. One of the problems is mounting injuries. Ramirez has a sprained shoulder and he’s been their best hitter. He’s day to day, showing some improvement Tuesday with mobility in the left shoulder, and the Red Sox are trying really hard to avoid disabled list time for someone who has been on the DL five times in his career and missed many more games because of nagging injuries. Ramirez was on the DL for a strained lower back, and a sprained left shoulder in Florida in 2011. He tore a ligament in a thumb and strained a left hamstring in 2013 with the Dodgers. He strained his right oblique in LA in 2014. One of the reasons teams stayed away from Ramirez was his propensity to get hurt. He changed positions from the infield, where he couldn’t stay healthy, to the outfield. He ran into a wall less than a month into the season and once again injured his left shoulder. The Red Sox were dealt a blow when they lost catcher Christian Vazquez to season-ending Tommy John surgery late in spring training. They were dealt another blow losing backup turned starting catcher Ryan Hanigan to a broken knuckle, which is expected to keep him out until at least the All-Star break. They haven’t been able to keep right fielder Shane Victorino on the field; he’s currently on the DL with a hamstring injury. Allen Craig hasn’t been able to get untracked at the plate. The man who led all of baseball hitting with runners in scoring position for three years is now on a team that hits .220 in those situations, fifth-worst in baseball. All of the internal metrics and analytics seemed to favor the Red Sox as the best team. Their offensive WAR entering the season was better than anyone’s. Their pitching also seemed to be top-of-the-line. But the fancy numbers and actual results don’t seem to mesh at the moment. Porcello was part of that new look for 2015 and after a slow start, he’s has been delivering, including Tuesday night’s sparkling effort. Henry truly believes there’s more in the tank. Tuesday’s meeting seemed to emphasize that fact, that this team will rise to its level over time. And that’s the beauty of baseball. The Yankees stunk after five games and are very good after 27 games. Who knows how they’ll be after 50, 100, 150, 162? The Rays continue to do an excellent job of winning despite their limited payroll, despite their horrible attendance. The Orioles haven’t hit full stride. The Blue Jays are a top offensive team with pitching issues. The Red Sox have been a losing team over the last 540 games. Last to first to last to last? Or will they rise again? One game. One night. But one that felt good for a change.